Beatrix "big kids" backpacks are cute, functional and safe. Big enough to hold textbooks, lunch, a laptop, & more. These durable nylon packs have a large interior space with a smaller interior pocket. Sized for ages 5 to 10. 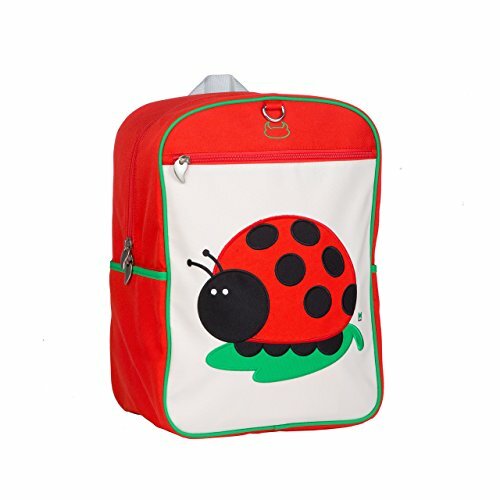 Beatrix New York big kid pack: Juju (ladybug), red, one size big enough to hold textbooks, lunch, a laptop, & more. These durable nylon packs have a large interior space with a smaller interior pocket. Exterior has a large front pocket and two side pockets. Padded back panel and shoulder straps. PVC free, lead free features:- Constructed from durable nylon and easy-to-clean laminated canvas. The large interior contains a smaller zipped pocket. Padded back panel and padded shoulder straps.- PVC free, lead free, phthalate free & BPA free.- Machine washable. Dimensions: 15 inches x 6 inches x 10.75 inches.